Dawn had broken to reveal another glorious day in paradise, and on board the USS Arizona and the repair ship USS Vestal alongside, the crew were taking it easy. All next week they would be hard at work preparing for sea, but today was Sunday, and that meant light duties. But within the hour out of nowhere, Japanese carrier-based aircraft would descend upon the unsuspecting Naval base. As the crews register bright red circles on their wings, the blood froze in their veins. They realized that hell had come to Pearl Harbor! Then, just before 08.10hrs, the unthinkable happened. A bomb from a Nakajima B5N Kate high-altitude bomber penetrated the ship’s armor plated deck and exploded in the forward magazine. Within seconds a cataclysmic blast ripped through the Arizona, devastating the mighty ship which would burn for two days, taking with her the lives of nearly twelve hundred men. 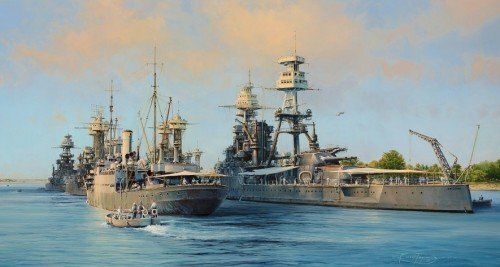 In tribute to all those who lost their lives at Pearl Harbor on that infamous day Robert Taylor has created his poignant new landmark painting. The Arizona has since become the focal point for the memorial at Pearl Harbor and this moving piece portrays this proud ship as those who survived would surely like to remember her - in all her glory prior to the attack. Reproduced directly from Roberts working drawing, this outstanding companion print is issued with every edition of The Calm Before The Storm, creating a fitting commemorative collectors edition for the 70th Anniversary of this historic event. Robert Taylor's publisher is proud and honored to announce that no less than FIVE crew that were actually aboard the Arizona that fateful day have come together and to sign this special two print edition to commemorate their fallen comrades. Seventy years after the tragic sinking of the Arizona, this is probably the last time that so many of her survivors will be able to join together for such an historic event.